Dying Star: Prophecy is the first volume in a new Scifi series Dying Star, written by Samsun Lobe. The Star Shu is slowly dying, becoming a black dwarf as it's remaining energy depletes. This causes the orbiting planet Gebshu and it's moon to change beyond recognition. The world becomes engulfed in tornados and tusamis, tearing the very land apart and destroying whole mountain ranges. These storms lasted for decades and millions of Gebshu's inhabitants perished. In the final months the polar ice sheets melted and the land submerged beneath the waves. The Emperor of Gebshu and his most loyal followers escaped to the moon while those left behind perished. A scattered few survivors managed to find a new life under the surface of the water to try and rebuilt their shattered civilisation. Var is a member of the Enki ocean tribe, living completely under water and he finds himself thrust into a world he doesn't understand. Meanwhile the rather unstable Emperor sends his 2 sons on a very dangerous mission with the hope they do not return to full-fill an ancient prophecy. I must admit that it took me a good few pages to actually start enjoying Dying Star, the premise is an interesting one but the very start of the novel is a little weak. Being the first volume in a series, there is quite a bit of background building and character development going on, as you would expect but the novel itself isn't that long which leads to a slight feeling that all the action is in the latter half. It can also take a little time to get yourself used to the unusual names in Dying Star, which actually appears to be much less commonplace in modern novels than the science fiction tales of the 20th century. Once you get used to this the novel's pace picks up, the action escalates and the plot becomes much more engrossing. Plenty of fight scenes and gore adorn the later half of the novel and these are well written and imaginative. Having one half of the story underwater also gives a fairly unique spin on the storyline and keeps the reader attentive to the plot. The novel itself is well thought out, easy to read and has an increasing pace as the plot develops. Samsun has a clear and descriptive style of writing that encourages the imagination and produces a rich world of fantastical creatures and interesting characters. This talent also manifests itself later in the novel with the rather excellent fight scenes. 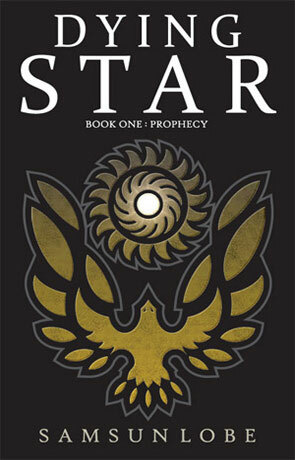 Dying Star: Prophecy is a rewarding novel for those who persevere past the beginning chapters and a recommended read.